Inspired by the Peruvian jungle's many shades, this rug is mesmerizing. 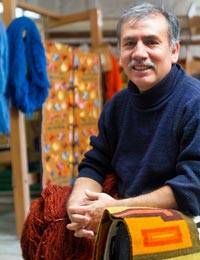 Cerapio Vallejo's traditional artistry finds new expression: 'I like to experiment and vary my production so they may suit new types of architecture and colors.' For the líneas (lines) series, Vallejo blends the weaving techniques first introduced by his Wari ancestors (600 – 1000 AD) with a contemporary allure in an admirable harmonization of past and present. Titled 'Líneas III' in Spanish.